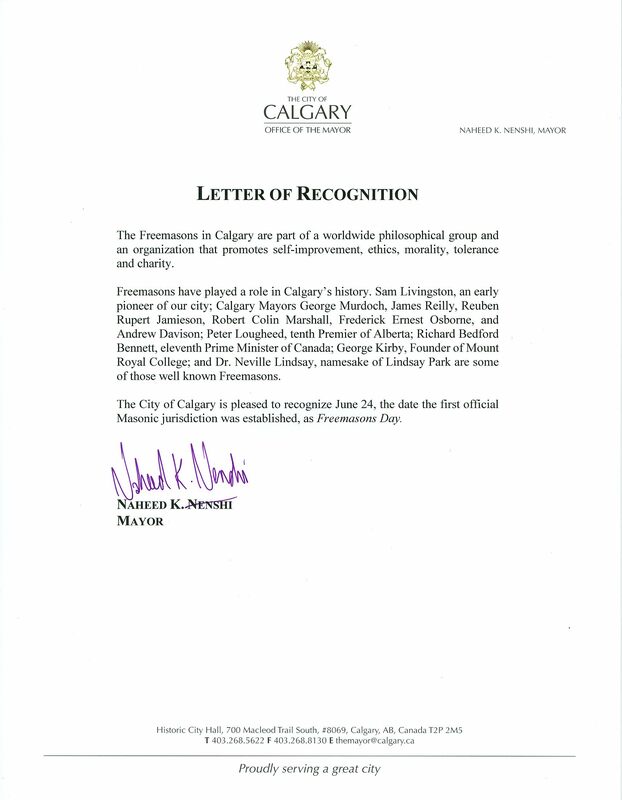 Freemasons Day in Calgary – Celebrating the heritage and history of Freemasonry in Calgary, Alberta. Freemasonry is one of the world’s oldest and largest non-religious, non-political, fraternal, and charitable organizations. It teaches self-knowledge through participation in a progression of ceremonies. Members are expected to be of high moral standing and are encouraged to speak openly about Freemasonry. As a society of men concerned with moral and spiritual values, members are taught its principles by a series of ritual dramas — a progression of allegorical two-part plays which are learned by heart and performed within each lodge — which follow ancient forms, and use stonemasons’ customs and tools as allegorical guides. The organization instills in its members a moral and ethical approach to life: its values are based on integrity, kindness, honesty, and fairness. Members are urged to regard the interests of the family as paramount, but Freemasonry also teaches compassion for all people, care for the less fortunate, and help for those in need. 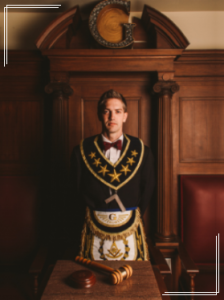 Given Canada’s history as a dominion within the British Empire, Freemasonry in Canada traces its origins to the United Grand Lodge of England, the Grand Lodge of Scotland and the Grand Lodge of Ireland. Erasmus James Philipps, a Canadian soldier and political figure from Nova Scotia, became a Freemason while working on a commission to resolve boundaries in New England and, in 1739, became provincial Grand Master for Nova Scotia. Philipps founded the first Masonic lodge in Canada at Annapolis Royal in Nova Scotia. Over the next two centuries, Masonic jurisdictions spread west to the Pacific, often following the expansion of Canada’s rail lines. 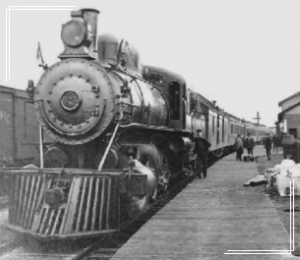 On August 15th, 1883, the Canadian Pacific Railway track was laid through the site of what is now the city of Calgary. A few days later, the first freight train arrived, bringing with it the first printing plant of what was to become The Calgary Herald. The initial issue of the paper carried a notice calling upon all Masons interested in the formation of a Masonic lodge to meet in George Murdoch’s shack, east of the Elbow River. A large number of Masons turned out for the meeting and a decision was made to request formal recognition for Bow River Lodge from the Grand Lodge of British Columbia. After waiting for nearly seven weeks for a reply, the petitioners sent a second application, this time to the Grand Lodge of Manitoba. A favorable reply was received from both Grand Lodges at about the same time. Communications between Calgary and British Columbia at that time had to go from Calgary to Winnipeg, then on to Omaha, then to San Francisco, and finally from that seaport to Victoria three times weekly. Under such troublesome conditions of transit, it was considered advisable to accept recognition and formal dispensation offered by the Grand Lodge of Manitoba. Accordingly, the dispensation was received on January 12th, 1884, and Bow River Lodge held its first official meeting on January 28th of that year. Membership in Alberta continued to grow and several other lodges were chartered over the coming years, until it was resolved in 1905 — the same year that Alberta became a province — that a Grand Lodge of Alberta should be constituted. 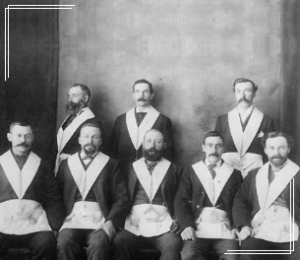 In the century that followed, Calgary’s Masonic lodges became extremely popular venues for men to meet socially and without regard for their position in life, their political leaning, or their religious affiliation. Membership consisted of men who shared a common moral and spiritual vision of the world, and who believed that the Creator wanted them to lead good and decent lives, to serve as upstanding role models to their families, to show love for humankind, to practice charity and good will, and to be true to themselves and to others. Such men played an integral role in shaping Calgary’s history, and among the most prominent were Masons like Sam Livingston, an early pioneer of our city; George Murdoch, Calgary’s first Mayor; James Reilly, Calgary’s sixth Mayor; Reuben Rupert Jamieson, Calgary’s 16th Mayor; Robert Colin Marshall, Calgary’s 20th Mayor; Frederick Ernest Osborne, Calgary’s 23rd Mayor; Andrew Davison, Calgary’s 24th Mayor; Peter Lougheed, 10th Premier of Alberta; Richard Bedford Bennett, 11th Prime Minister of Canada; George Kirby, Founder of Mount Royal College; and Dr. Neville Lindsay, after whom Lindsay Park is named. 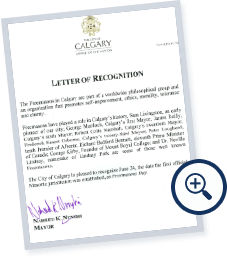 As of 2013, and in recognition of the organization’s countless contributions since the city’s founding, the City of Calgary officially recognizes June 24th as Freemasons Day in Calgary.